Preserve the Harvest Series presents a new fruit or vegetable every month with the goal of helping you get the most out of fresh fruits and vegetables harvested during peak season. Whether you grow your own fruits and vegetables, buy them at the Farmer’s Market or your local grocery store, it is good to remember the best time to preserve your bounty is when it is plentiful. Preserving the harvest stocks your pantry shelves and freezer with whole foods that you can feel good about, foods that taste great, and this approach saves you money. A sane approach to sustainability! Next up…Sweet Potatoes. Let’s first clear up a common misconception many have about sweet potatoes…they are not yams. Although similar, sweet potatoes and yams come from two entirely different families. Sweet potatoes come from the morning glory family while yams are found to be more closely related to lilies and grasses. Sweet potatoes have a variety of colors. Their skins range in color from white to yellow, red to purple and brown. The inner flesh may be white, orange, yellow or orange-red. They are also classified into two categories; firm or soft. Those classified as soft remain soft after cooking and those classified as firm remain firm. Another interesting note is that here in the United States most of the “yams” we buy are actually sweet potatoes but of the firm variety. Yams can be found but they are harder to come by. The large majority of yams come from Africa, so a good place to look for the real thing would be an international market. Sweet potatoes are available most of the year but are harvested in Fall. Buy in October – January for best quality. Sweet potatoes can be found in farmer’s markets, health food stores and supermarkets. Choose organic whenever feasible for best quality and taste. Choose sweet potatoes that are heavy for their size, free from soft spots, blemishes and sprouting eyes. Handle gently; sweet potatoes bruise easily. Do not put sweet potatoes in the refrigerator. It is best to store them in a cool dark place with plenty of ventilation. 50 degrees is the ideal temperature. If stored properly sweet potatoes may keep for up to 3 months. 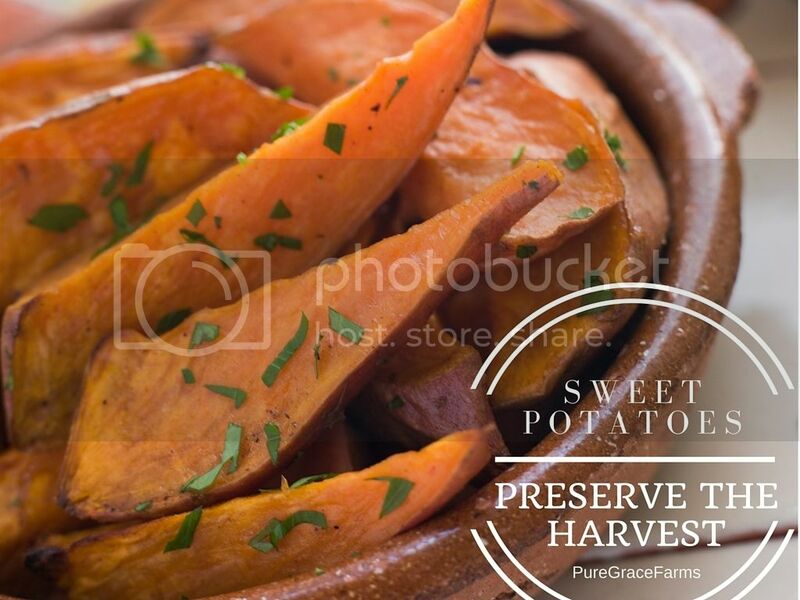 If proper storage is not obtainable, buy only what you can consume in a week or consider freezing your sweet potatoes to preserve the harvest. When freezing sweet potatoes it is good to take a moment and consider what uses you will be using your sweet potatoes for. Choose either the firm or soft variety depending on your specific need. For example; choose a firm variety for soups and stews or a soft variety for mashed and pureed dishes. Choose good quality sweet potatoes that are similar in size and shape and scrub sweet potatoes thoroughly before cooking. 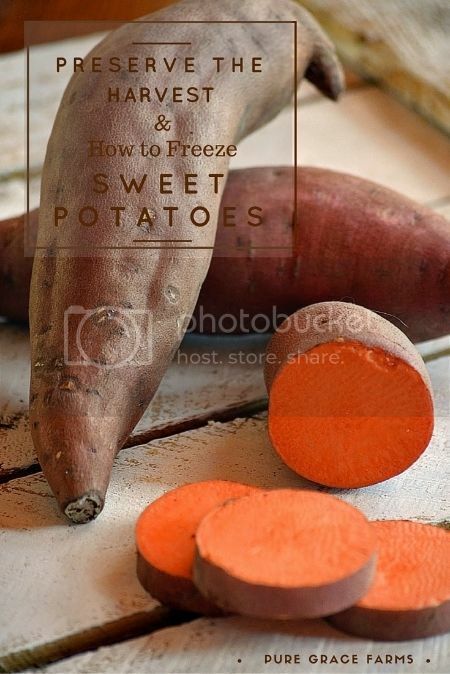 There are several methods that can be used when cooking your sweet potatoes in preparation for freezing. Baking, boilings, steaming, or pressure cooking will all do the trick. Choose the method that works best for you. There are several methods that can be used when cooking your sweet potatoes in preparation for freezing. Baking, boilings, steaming, or pressure cooking will all do the trick. Choose the method that works best for you. Allow sweet potatoes to cool completely. If not peeled, remove skins. Mash, puree, quarter or slice according to preference. If sweet potatoes have been mashed or pureed, stir in 2 tablespoons orange or lemon juice to each quart of sweet potatoes. Dip whole, sliced or cubed sweet potatoes into a solution of ½ cup lemon juice to 1 quart of water. Pack into containers leaving ½ " of room at the top of the container for expansion when frozen or vacuum seal as desired. Frozen sweet potatoes will maintain the freshest quality for 12 months or more depending on the packaging. Proper vacuum sealing may extend the storage time considerably. Preserve the Harvest Series presents a new fruit or vegetable every Tuesday with the goal of helping you get the most out of fresh fruits and vegetables harvested during peak season. Whether you grow your own fruits and vegetables, buy them at the Farmer’s Market or your local grocery store, it is good to remember the best time to preserve your bounty is when it is plentiful. Preserving the harvest stocks your pantry shelves and freezer with whole foods that you can feel good about, foods that taste great, and this approach saves you money. A sane approach to sustainability! Next up…How to Freeze Sweet Corn.